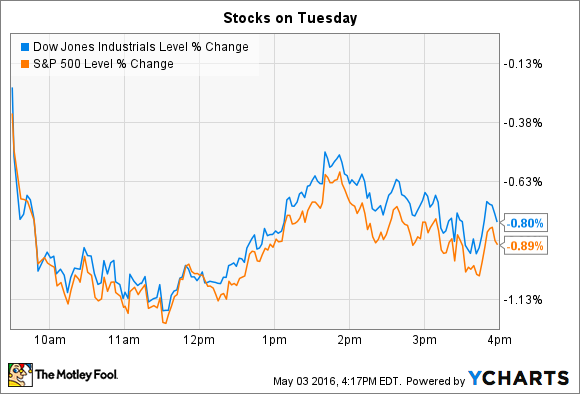 Why these two stocks fell harder than broader indexes on Tuesday. With dozens of companies announcing quarterly numbers, earnings season is driving significant price swings in individual stocks. Among the biggest movers on Tuesday were Pitney Bowes (NYSE:PBI) and RetailMeNot (NASDAQ:SALE), which both fell sharply. Mailing solutions specialist Pitney Bowes dropped 10% after announcing surprisingly weak first-quarter earnings results. The 5% sales decline was worse than the 3% drop that Wall Street was targeting, while adjusted profit of $0.34 per share came in far below consensus estimates of $0.41 per share. The North American mailing segment logged a minor sales decline and a slight decrease in profitability, which is about what management expected. Its presorting business, meanwhile, produced steady revenue and profit gains . However, the software division underperformed, according to CEO Marc Lautenbach. The segment posted a double-digit revenue decline, which pushed it into an operating loss for the quarter, compared with a slight profit in the year-ago period. "We did not execute in our Software Solutions business, which also experienced weaker technology market conditions," Lautenbach said in a press release. Pitney Bowes has shaken up the management team in that division and is projecting better results over the next few quarters. In fact, Lautenbach and his executive team reiterated their full year outlook that projects a slight sales decline that should produce earnings of roughly $1.90 per share. Wall Street seems less optimistic that Pitney Bowes can achieve those targets, judging by the stock's sharp drop on Tuesday. RetailMeNot's stock fell despite Q1 earnings results that beat management's early April guidance. Sales slipped 9% to $54.6 million, compared with its projection of as much as $54.5 million of revenue. Adjusted earnings of $12.3 million fit right into the company's target of between $12 million and $12.5 million. The digital coupon specialist's numbers showed stress on the business. Website traffic fell 10%, and visits from mobile devices ticked down by 1%. RetailMeNot's desktop sales, which represent about 70% of the operations, fell 19%. Yet the company still generates plenty of valuable user engagement from its army of dedicated deal-seekers. It attracted 700 million visitors to its portfolio of websites and apps over the past 12 months. "We have a wealth of information and data on the types of offers that resonate with consumers across multiple categories," CEO Cotter Cunninham told investors. "This information results in insights and best practices we are able to pass along to our paid retailer partners," he explained. RetailMeNot issued a conservative outlook for the coming quarters, which could be the main reason for the stock sell-off. Sales are projected to fall 6% in its core business. Its new gift-card division should produce strong growth -- but hardly any profits. Altogether, it's likely investors won't become more optimistic about this business unless it can show enough growth on mobile to make up for large declines in the desktop deal-hunting traffic.